On August 21, 2017, a once-in-a-lifetime total solar eclipse passed straight across the heart of Nebraska...and so did a line of summer storms. 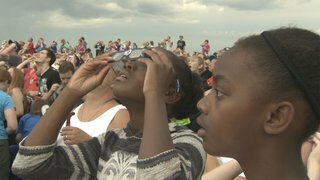 From Carhenge to Homestead National Monument, from sky to prairie, relive the Great American Eclipse in 360-degrees as thousands wait in the rain with Bill Nye the Science Guy to see if the clouds will part in time for totality. Producer Brian Seifferlein is an Emmy Award winning NET Nebraskaproducer/videographer/editor, who has traveled the globe to document diverse people and places they live. His workincludesNOVA: Secrets Beneath the Ice, Beef State, Solomon Butcher: Frontier Photographer, Ted Kooser’s Poetic World, Mind Over Murder, and Watching Our Water. Recently he developed and lead the video reporting initiative for Harvest Public Media and has helped push NET Nebraska into new arenas for storytelling through his 360-video productions. Executive Producer Chad Davis is the founding AGM of NET Nebraska’s Emerging Media department, which serves as a ‘skunkworks’ within NET for new internet-based technologies, exploration of new production techniques and development of experience-based content initiatives. His career includes stints at WGBH, WETA, and New Mexico PBS, and he is also a Consulting Producer for the international travel series "Travels with Darley," seen on PBS stations and Amazon Prime. Read the full Q&A360-degree video has become an important part of modern day storytelling. PBS spoke with Executive Producer Chad Davis and Producer Brian Seifferlein about what drove their choices in the use of this technology, as well as their film locations, to document the Great American Eclipse. PBS: What inspired you to shoot this event in 360? Chad Davis: The funny thing to me about the success of this piece is that I had initially ruled out our team even covering the eclipse. Our department exists to experiment with new forms for content creation and distribution, and while other departments at the station had good ideas for coverage, I couldn’t see a hook that made sense for our Emerging Media department. Add to that the possibility that the whole thing would be stormed out, and and the risk didn’t seem worth the reward. So kudos to Brian. He found a video on YouTube of a filmmaker capturing a 2016 total solar eclipse in Indonesia with a 360 camera. We had just begun heavily experimenting with 360 video that year and, based on the shadow on the ground in the shot, Brian deduced the guy in Indonesia used the same GoPro Omni rig that we had been using for our experiments. Brian was also really taken with how the crowd reacted to the eclipse. Once we could tell that there was a reasonable chance to actually get usable footage from the event we realized we had a great hook for an experiment: What if we could give viewers the chance to experience the total solar eclipse over and over again as if they were there with thousands of people? Brian Seifferlein: “The Great America Eclipse” was a communal event like no other for the state of Nebraska and for the nation. Moving directly across the United States on a Northwest-to-Southeast trajectory, Nebraska sat right in the path of totality. It was the largest tourism event in the state’s history, drawing people from bordering states and around the world. The events were large and small, some crafted in the spirit of a hometown festival, and others – like those at the Homestead Monument of America – were planned years in advance and drew science celebrities like Bill Nye. We knew this event could capture something ancient in the human spirit, millions of eyes pointed upward for one moment in time, together, through darkness and light. The Emerging Media Department at NET had only a few 360-degree videos under its belt at this point, but we were acquiring new gear and starting to understand the post-production process. I pitched the idea to Chad and he initially hesitated. I figured, “Well, I’m going somewhere that day, and I’m taking a camera (be it 360 or not) come what may.” Even I wasn’t taken with the idea of seeing an eclipse in 360, I figured the sun would take up mere tens of pixels in a sphere of thousands. But all around me, in my personal life, the world was abuzz; “Where will you be? What are you doing? We’re going to a place guaranteed to have the most time in totality!” How could we miss this event? That’s when I realized – focus on the humans and their reactions, not on the sun. I sold Chad on an idea of excitement, of an experience that begs viewers to look around at people, and do less looking up at the sky. More than one million people watch and listen to NET –Nebraska’s PBS & NPR Stations –each week. Our statewide public media network offers free, high-quality educational programming for children, engaging entertainment, clever drama, trusted news, history, science secrets, and a wide variety of arts and music. Our award-winning content enriches lives, addresses needs and concerns, and empowers Nebraskans to build thriving communities. NET serves each of the state’s 93 counties with 52,560 hours of programming each year, on four television and two radio channels, plus we offer robust online, mobile and digital content. Our commitment to Nebraska includes production of award-winning local television and radio series and documentaries; broadcasting live high school and college sports; welcoming children, families, caregivers and educators to learning events; and keeping Nebraskans safe by collaborating with agencies to relay emergency news and weather alerts. Visit netNebraska.org.